Electronic Kit School. - Sometimes we need to build power bank unit with higher voltage output that input. It is mirrored from the cell battery which give 3.7 volt output and we need used it to supply many electronic devices with 5 volt voltage needed. It is also shown in microcontroller IC that need 5 volt to supply and make it work. So, in this condition we need step up circuit to convert dc to dc from 3.7 volt like from Lithium-Ion (Li-Ion) battery to 5 volt. One circuit that we will give you to do this work is named 5V/100mA Power Bank with 3.7V Lithium-Ion Circuit Based on MC34063 like in Figure 1. below. The main component in this circuit is MC34063 as the monolithic control circuit containing all the active functions required for switching dc-to-dc converters. 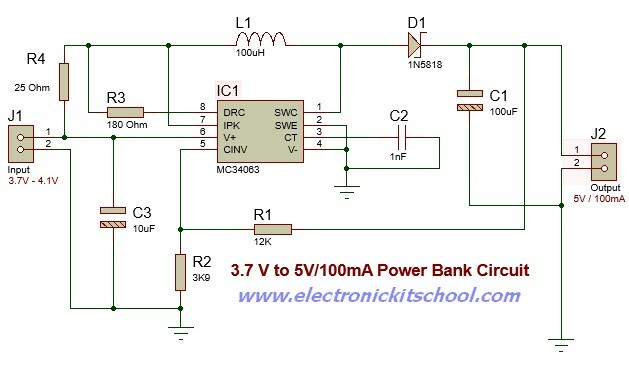 Circuit like in Figure 1 above show you about 5V/100mA Power Bank with 3.7V Lithium-Ion Circuit Based on MC34063 that can convert your Lithium-Ion (Li-Ion) 3.7 volt to 5 volt with more than 100mA output. In this circuit the main component used is MC34063 with 8 pins that can functioned as the an ultra-simple boost converter. Depending the data sheet of the MC34063 IC mentioned that this IC is a monolithic control circuit containing the primary functions required for DC to DC converters, consists of comparator, controlled duty cycle oscillator with an active current limit circuit, an internal temperature compensated reference, high current output switch and driver. MC34063 IC was exclusively designed to be incorporated in Step-Up (boost) and Step-Down (buck) for voltage converting applications with a minimum number of external components. This IC also quite flexible, but picking the right component values can be tricky, especially if the output current can vary across a wide range. Circuit above also need small number of components used to support the work of this IC. Make sure that the you use with a 100µH/1A inductor (L1), and 1% tolerance resistors as R1-R2. And now you can get the better and a great choice to consider with IC MC34063 with output 5 volt and 100mA as the nice power bank to supply your 5 volt microcontroller system or other from 3.7 volt Lithium-Ion.